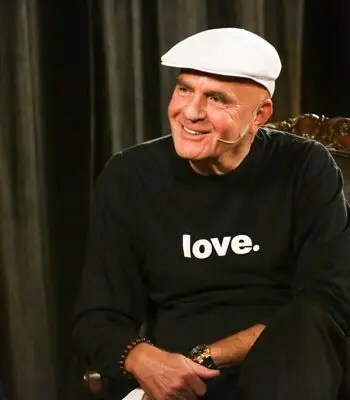 The loss of Wayne Dyer gave me that nudge into actions to stop the procrastination and excuses as time slips away. His inspiration opened my mind to the Tao, the power of intentions, and the wisdom shared through poetry and short form writing. So as another great man joins these men in the sublime, we can all see the footprints in the sands he has left for us to follow and embrace his genius and mentoring of thoughts. I was lucky to meet him a couple of times when I volunteered for Hay House’s “You Can Do It.” If any man could get you motivate to move forward, Dr. Wayne Dryer did for millions of people, supporting their vision with his invisible touch through his books and talks. He always had a smile on his face and in his heart. I am grateful for those few minutes of time where he thanked me for volunteering after I thanked him for sharing his time with all of us. His presence still endures me as I reread his books and reflect on what I am doing with my life. I have been told by many to get myself out there more. So I write my words of life’s lessons and the many perspectives in each situation. Now I realize I have short changed myself with the opportunities I had available to me. I am happy with many of the things I have done with some heavy consequences at times. Regrets are a waste of time. We are here to live through our experiences of our dreams. Not just make a list and hope someday to have enough money to relax enjoying ourselves. How many people do you know who are waiting for retirement to travel? Or realizing later in life, their health keeps them from those places they wanted to go to… they just worked their lives away. Sure, maybe their work helps someone else for a moment, put some cash in their bank account. But what is money? Energy! Energy is to be used to be recycled to get more energy… it helps the economy and the body needs to use off the extra. I learned early to value myself and the things that add to my joy for living. So I make sure to travel, take photos of nature, count my blessings. I know the “energy” I need will be available in some form. I am a better person for taking the time out for me. I am here writing as I am on one of those adventures… to the mountains with a thunderstorm outside rumbling. Birds flying close to take cover from the rain. Silence whispers to me in nature. Calming, centering, and giving me clarity. perhaps it is because hears a different drummer. Dr. Dryer taught us well… to watch our thoughts, be of kindness, trust in the Divine. He completed his mission and more so. We are all blessed by his work. I thanked him and I know he is infinite love and still with us. I honor the place in you where we are all one. Thank you, Dr. Wayne Dryer for the reminders of the years and in the legacy you leave behind, forever alive. Blessings and Warm Thoughts to your family and friends. The Wayne Dryer family is allowing a free viewing of his movie, The Shift. It is worth watching a few times.